You want to learn how to become an actor? Join the club! Most everyone at one time or another has probably thought about becoming an actor. They watch their favorite shows and movies and think, “I can do that!” They think it’s easy and glamorous. But what most people don’t realize is that it’s a lot of hard work. It’s a huge amount of fun but yeah, it’s work! It takes a special kind of person to want to become an actor. They have to be determined, unafraid of rejection and willing to work hard to consistently get better at their chosen craft. This isn’t a site on how to become famous. This isn’t about becoming a star because odds are, you won’t. Hopefully you’re here because you want to learn how to be the best actor you can be. Whether you’re in Los Angeles or New York, Ohio or Colorado, you absolutely can make this happen. One thing you should know from the start though is that being an actor is expensive. You’ll need money for headshots, headshot reproduction and acting classes. Eventually, you’ll need to market yourself with postcards and a website. You’ll also need to add your material to casting websites such as Actors Access. It’s definitely not cheap! 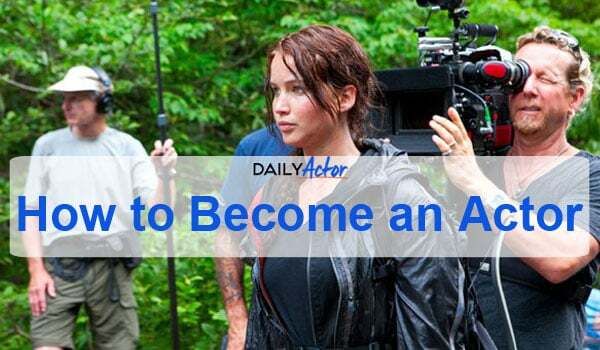 So, if you’re looking for steps on how to get into acting, you’ve come to the right place. One of the first things you’ll need is a headshot. This is not the place to skimp and be cheap because this is your calling card. If you submit an awful headshot, 99% of the time it’ll be filed away in the trashcan. Having a headshot that isn’t professional, it just automatically shows casting directors, directors and producers that you’re not serious about acting. What’s the cost? For New York and LA, paying $400 to $500 for a headshot session is the norm. Obviously, if you live outside of these cities, you should pay less. The next thing you’ll need is an acting resume. This isn’t like a resume you’d give to someone when you’re applying for a “normal” job. An acting resume is totally different. “I’m just starting out and have nothing to put on my resume!” I’ve heard that before and don’t worry. Everyone starts somewhere. You can easily fix that! Audition for small roles at your local Community, Dinner theater or join the cast of a Church or School production. If you’re in school then join the drama club. All of these things can be listed on your resume. You can even list any acting classes you’ve taken. If there isn’t a role for you in the upcoming show, ask if you can help out. Theaters always need a good, responsible volunteer. This will get you in with the theater community and will make it tons easier when you actually do audition. They’ll already know you so it’ll be easier for them to take a chance on you! Click here for more information on acting resumes. And if you need it, here’s an acting resume template. I’m sure there is some kind of acting class or acting program near you. I grew up in a small town and there were at least 5 acting classes within 20 minutes of where I lived. If you’re still in school, try and find a summer acting camp. Usually, these are all day workshops that take place Monday-Friday. You’ll learn tons and walk away a much better actor. Plus, these are great places to meet people who are into the same things as you! There are a bunch of great schools you can choose for acting. You’ll be immersed in all things acting so how can you not improve? You’ll learn everything from movement, costumes, theater history, acting styles and techniques and best of all, you’ll be performing constantly. I went to college in Baltimore, Maryland and loved my time there. I met some wonderful teachers and made some great friends that I still keep in touch with to this day. Like I said in the resume section, auditioning for Community Theater is a wonderful way to get started. I did a handful of musicals for my local Community Theater when I was in high school and I loved every minute of it. Plus, I learned a lot in the process. Start off as an ensemble member of a large cast (every town does Oklahoma or another huge production at least once a year). Again, by getting involved, you’ll get to know the local theater companies and the people involved. The more they get to know you, they easier it’ll be to nail a part in one of the upcoming shows – especially if you’ve started off with no experience. Audition as much as you can. Audition even if you don’t want the part. The more you audition, the better you’ll be at it. Learn to love auditioning because chances are, that’s all you be doing the first couple years once you have decided to become an actor. Don’t know what to start off with? Try something from Christopher Durang or Martin McDonaugh. Or, how about something that’s currently playing on Broadway? At this point, you might want to start looking for an agent. Do you have to have one? No, not at all. Especially if you’re not a member of any of the acting unions (SAG-AFTRA or Equity). Don’t ever pay an agent or manager a fee for joining their agency or company. There are actor scams out there where you’ll be asked to pay an “agency fee” when you sign up. Don’t do it. Ever. The only time you should pay an agent or manager is after you’ve received payment for an acting job you’ve booked and already worked on. Will you need a manager? Odds are you won’t. You’ll only need a manager when you have a career that actually needs to be managed. Typically, managers to 20% of what you’ve made on each job. That’s a lot of money to give to someone when you’re only working a couple times a year. If you’re in Los Angeles or New York City, check out our actor mailing labels. We have sets of casting director mailing labels and agent mailing labels updated monthly. How do you find acting auditions and open casting calls? If you’re not in LA or NYC, check your local paper or their website. Google – auditions ‘my city’ – and I’m sure something will come up. Also, check out Actors Access or call your local SAG-AFTRA office. Most either have hotlines or audition information listed on their site. That’s how I found out about the audition that got me my SAG card. You have to treat acting as a business because that’s what it is, a business. When you’re called in for an audition, be prepared. Know your scene, monologue or your song. Come with your headshot and resume (stapled together!). Be professional. You might only have one shot with that casting director. Make it the best and show them you have the goods! Casting directors, directors and anyone who can hire you want to know that you are the answer to their casting “problem”. They need you and they want you to be great! They are rooting for you. Don’t go into this blind. Nothing irritates me more than meeting an actor who doesn’t watch TV or isn’t up to date on what is going on in film, TV or theater. This is your job! My favorites are The Hollywood Reporter and Variety for film and TV news. Backstage is good as well. And of course, Daily Actor (shameless plug) – we feature interviews with actors and articles where actors talk about the craft of acting. And be sure to check out our Acting Tips, Acting Advice Columns, Interviews with Actors and Actors on Acting pages! I did my first play in Elementary school, did the fall and summer productions in High School and then started to do shows at my local community theater. When I went to college, I moved onto Dinner Theater and found other theater companies to work with. While I was doing that, I auditioned for an industrial film, got the part and was lucky enough to get my SAG card. I’ve been acting for years and I’ve loved every minute of it. Some people get lucky right off the bat. Some don’t… it could take them years. But, if you work hard, it’ll happen. If you’re prepared, it’ll happen.